Continental Refrigerator: Flexible. Period. Different applications, Flexible Solutions. DLG Griddle Stands: Designed to maintain NSF-7 temperatures in 100 degree ambient. Machine edge. Easy glide, fully extendable drawers with built-in safety clips. Drawers hold 6" deep pans side-by-side. Drawers support up to a 250 lb. capacity. Front breathing. Unique forced air design utilizes fans (approx. every 12") across the back unit. With optional features like a flat top, extended top, digital thermometer, compressor on left, and adjustable legs, you can get exactly what you want. It comes in a standard model, and you can add optional features. SW Sandwich Units: Certified under NSF-7 to maintain temperatures in 86 degree ambient and design to maintain NSF-7 temperatures in 100 degree ambient. Flush mount pans. Full length evaporator coils across back of unit. Easy-in-the-field conversion from door to drawer. Insulated lids. With optional features like front breathing, pan top on right, two tier drawers, three tier drawers, composite board, crumb catcher, flat lid, rear-mounted cutting board, single overshelf, and double overshelves, you can get exactly what you want. It comes in a standard model, and you can add optional features. 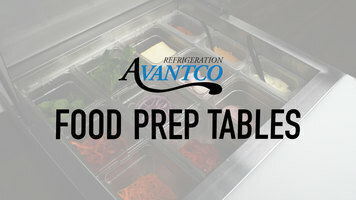 Watch this video to discover how Avantco sandwich and salad prep tables deliver unbeatable value, efficiency, and convenience for your business! 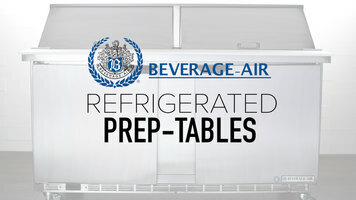 Watch this video to learn about our great selection of Beverage Air Elite Series refrigerated prep tables. With a large number of sizes and configurations available, you'll be sure to find one that fits your needs.